Do this activity at least three times (Game 1) and finally, write your own post saying which blogs you visited and which posts you left a comment on. Please provide the three links to your comments in the blog post you will write so that everyone can go read your comments. Write about one of the three posts you commented on. Why did you find interesting about that post? Remember to include links to the 3 or more posts you left a comment on. 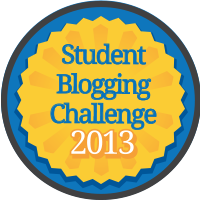 Pick 3 different blog challenges you enjoyed and give me an example of a blog post for each assignment (the example could be one you wrote, one written by a student in our class, or one of the following students: http://studentchallenge.edublogs.org/participants-march-2013/students-march-2013/). Write a paragraph telling me why you liked that blog challenge and what you liked about the example of the blog post you provided.